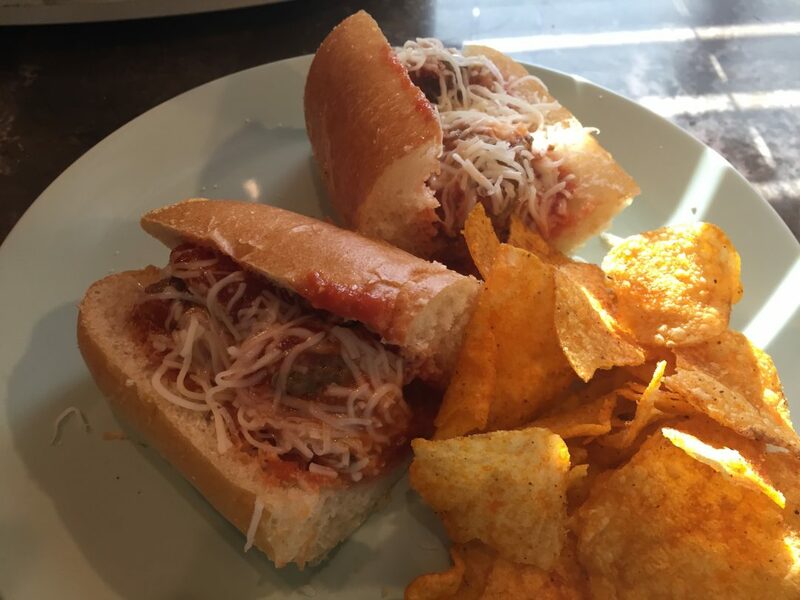 Tonight for dinner, we are having Meatball Hoagies. The ingredient list may leave you in doubt, but these are very easy to make – even for a beginner. They are simple to prepare and will sit in the slow cooker, making my house smell amazing, until dinner is needed. Very easy to double for a crowd. And isn’t that what dinner should be? Easy, simple, amazing. You could even put these on monthly rotation at your house. One month for hoagies and the next month as spaghetti and meatballs. They are on my menu this week, because I had ground chuck from the grocery store and some really good parmesan cheese in the freezer. I am trying to clean out my freezer this week so I can fill it up again! In fact, half of these will go back into the freezer in the form of a freezer pack. 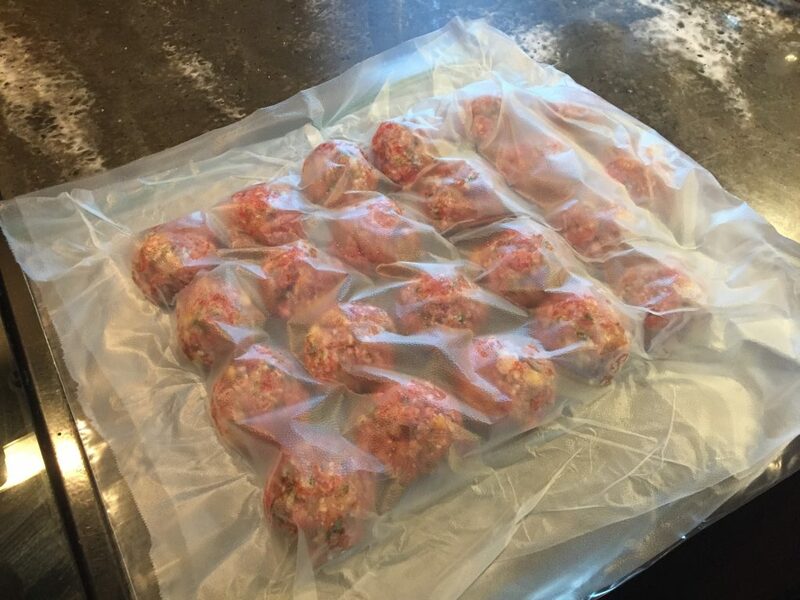 If you want to know more about freezer packs and how I use them to save time, click here. If you want to know how I menu plan, click here. I will assume the rest of you actually want to make these sandwiches! Alright! Now we are ready for part 1. The meatballs. Place the meat in the mixing bowl. I usually break off the meat into chunks and put in the mixing bowl that way. Less stirring later! Scramble the two eggs and pour over the meat. Still no stirring! Pour the milk, cheese, garlic, parsley, basil, oregano and salt over the meat. Sprinkle the bread crumbs OR saltines over the meat. Now, gently mix the ingredients together being careful not to over-mix the meat. You can use your hands or a mixing spoon. Leave the ingredients on the counter because you will need most of them for the sauce. Now begin portioning out the meatballs using a tablespoon. As you scoop them out, place in a pan over medium heat on the stove. You don’t need to cook them, just brown them on the top and bottom. You can do this in two batches. Don’t crowd them in the pan. Once the meatballs are browned, turn the stove off and prepare the sauce. Mix all ingredients together in a slow cooker. Place the meatballs into the sauce. Cover with lid. Turn heat to low. Cook for at least two hours to continue/finish cooking the meatballs. You can leave on low all afternoon if you want. When ready to serve, place 4-5 meatballs on a sub roll and cover with a slice of cheese. These are perfect for those crisp, autumn, football Saturdays! Make it today and then mark a batch of these on your calendar for fall. Yum! This recipe may seem daunting for beginners because of the long ingredient list. Make sure all ingredients are on the counter before you begin. Start with fresh meat (not frozen) placed in a medium size mixing bowl. 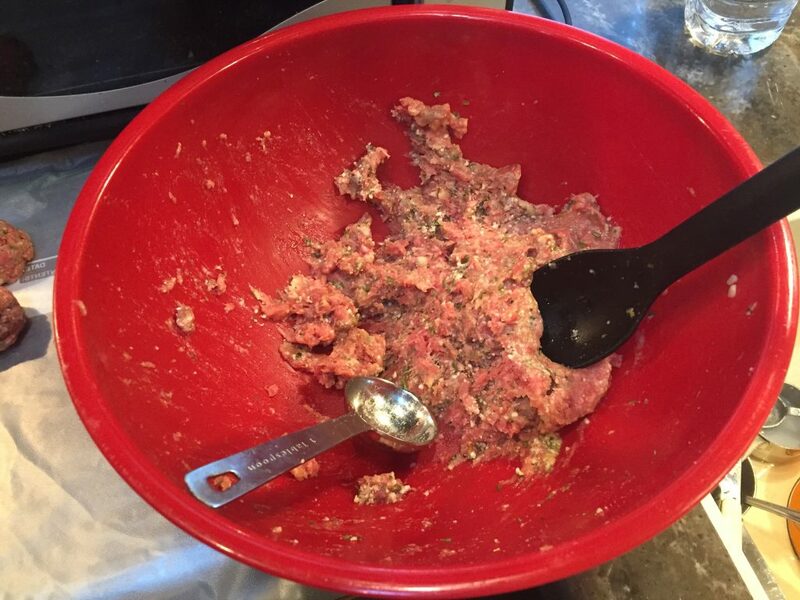 Don’t mix or stir the meat until all ingredients have been added. Scramble the eggs and pour over meat. Add milk, cheese, garlic, parsley, basil, oregano and pepper to the meat. Crumble bread slices OR add crushed saltines. Now, using your hands, gently mix the ingredients through the meat. Try not to over mix. You can also use a spoon or just a short mix in a Kitchenaid stand mixer. 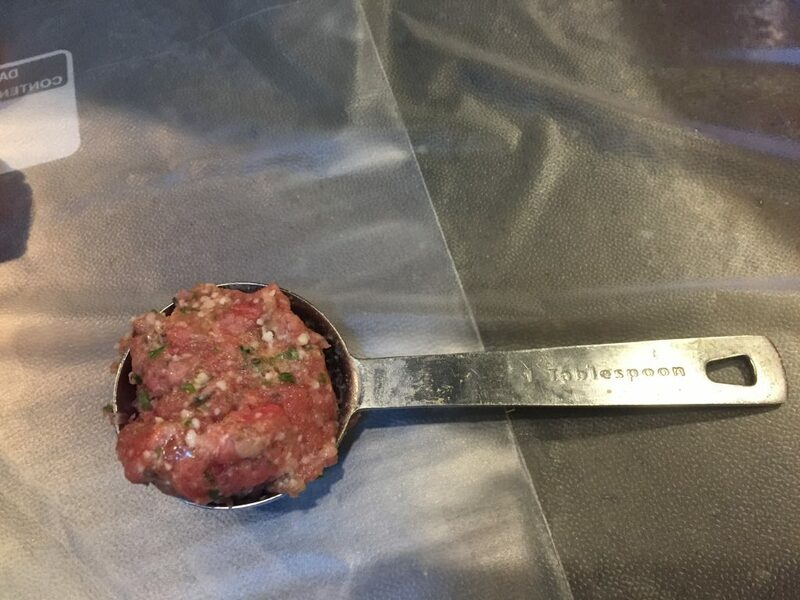 Once mixed, use a tablespoon to portion out meatballs. You can certainly make them larger if you desire, but do make them all the same size. 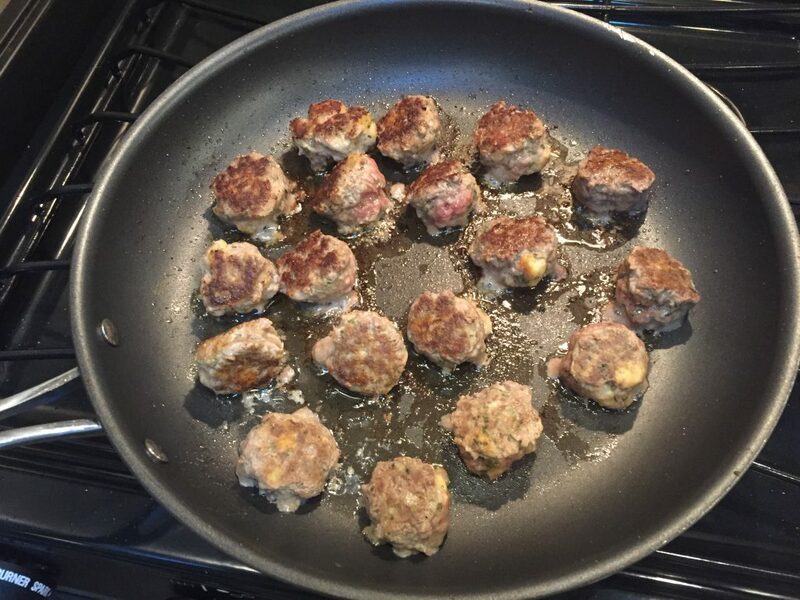 At this point, I placed the meatballs in a pan over medium heat and browned the meatballs on the top and bottom. Turn off the heat and mix the marinara sauce ingredients in the slow cooker. 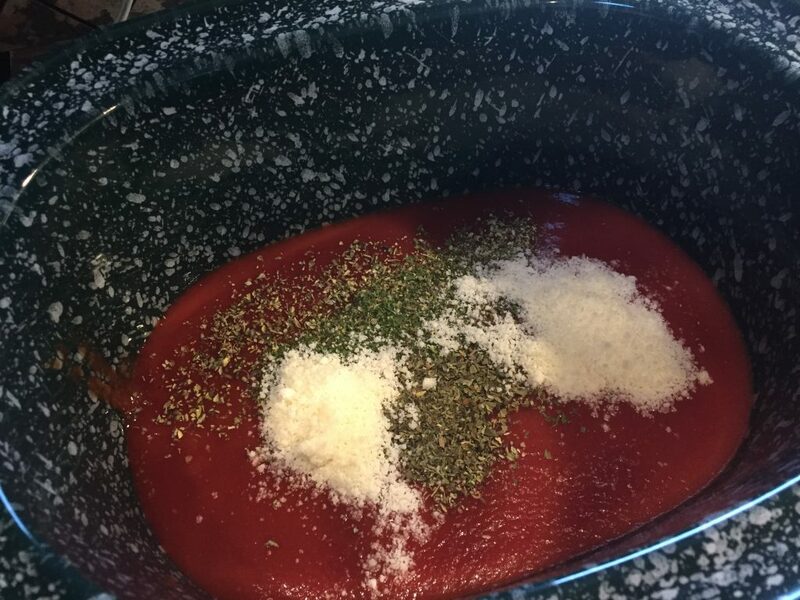 Pour the tomato sauce, cheese, oregano, basil, parsley and salt into the slow cooker. Stir. Place meatballs in the slow cooker. Cover with the lid. Set on low. Let the meatballs finish cooking on low for at least 2 hours. 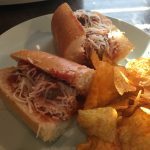 To serve as hoagies, put 4-5 meatballs into a sub roll and lay a cheese slice on the top. 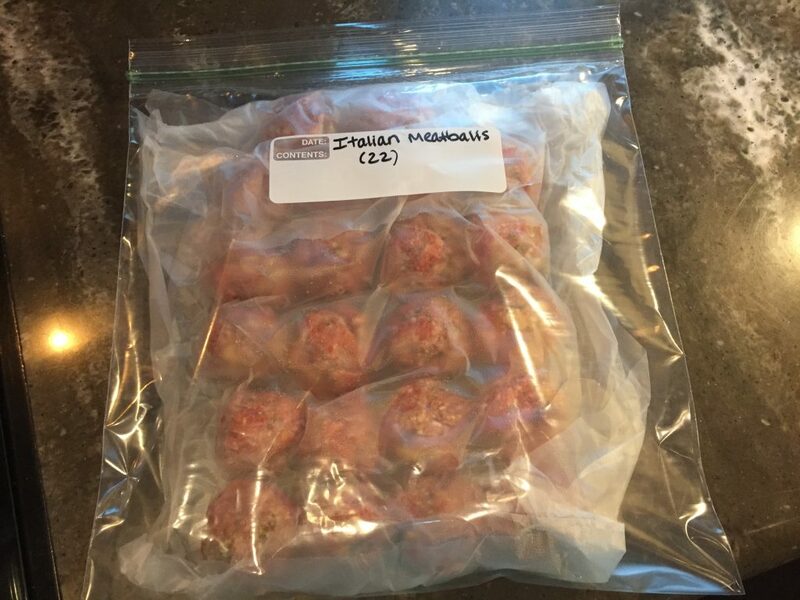 I use the amount above to make 20 meatballs for tonight and freeze 20 for later. These meatballs can also be used over spaghetti. No slow cooker? No time? 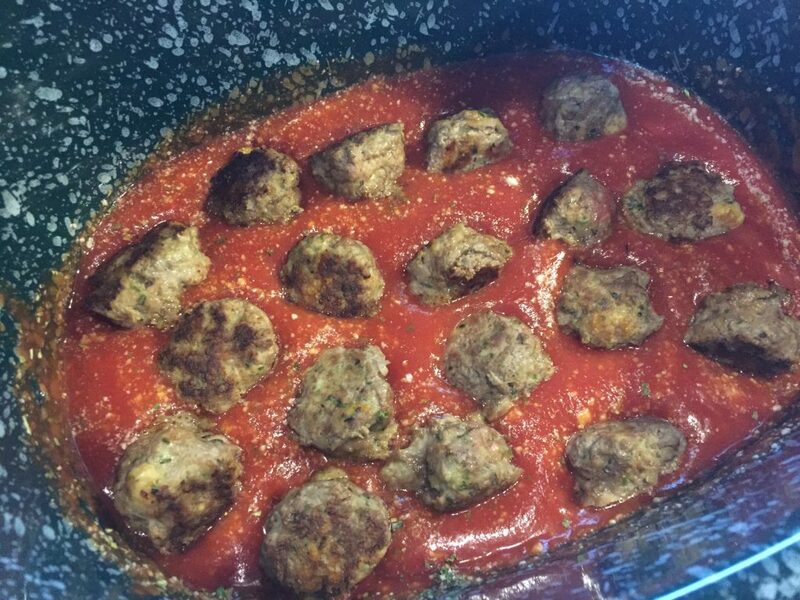 If you don’t have time to slow-cook, you can bake the meatballs at 350° for 20-25 minutes instead. Make the sauce on the stove using a medium size pot. Heat the sauce until boiling, then turn the heat down and simmer. Place meatballs in sauce. Serve with rolls and cheese slices. The slow cooker version is RV friendly.